For those of you who follow my blog, you will notice I’m somewhat obsessed with the Arctic – in part because of our large Northern Biodiversity Program, but also because it’s an ideal system for studying the ecology of arthropods. 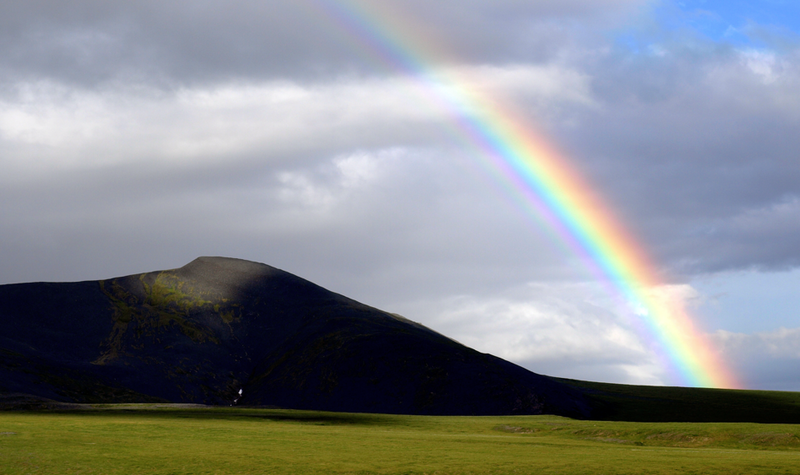 It also doesn’t hurt that the Arctic is a beautiful place to work! I am very excited to write about the latest paper published from our laboratory, titled Life history of tundra-dwelling wolf spiders (Araneae: Lycosidae) from the Yukon Territory, Canada. This has just recently been published in the Canadian Journal of Zoology, with Dr. Joseph Bowden as the lead author. Dr. Bowden graduate from my laboratory just over a year ago, and is now living in California with his family. Although the climate is somewhat warmer in California compared to the Yukon, he’s still actively working on research related to the biology of Arctic arthropods. Dr. Bowden was a terrific student in my laboratory, and has already published some work about the community ecology of Arctic spiders: he has one paper in the journal Arctic and another in Ecoscience. 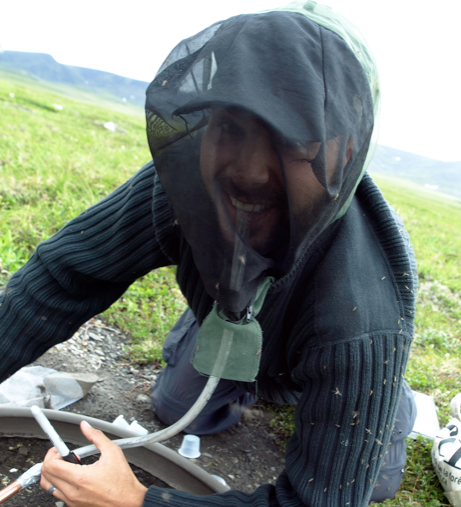 Dr. Joseph Bowden, working in the Yukon and ready for the biting flies! One of the main findings was that body size explained well the variation in offspring number. 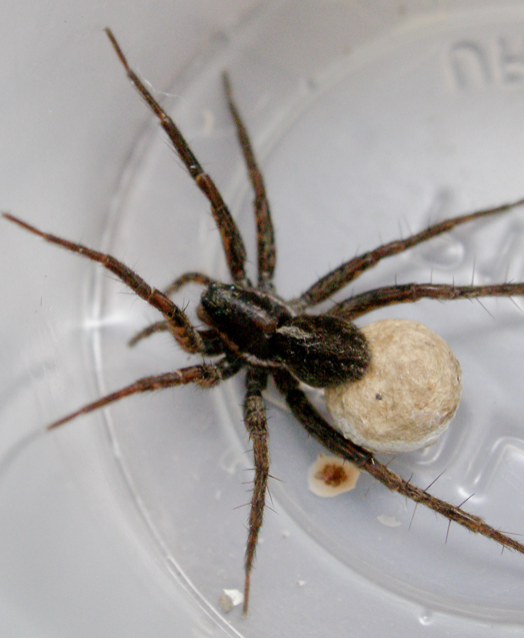 Stated another way, larger female wolf spiders produced more eggs, a finding well supported in the literature. A second main finding was that females with a lower condition allocated relatively more to offspring production than did females in better condition. This makes some sense – if the going is tough (i.e., poor condition), the females primary objective (from a fitness perspective) is to invest in offspring. A third key finding was that we found a negative relationships between egg size and number. These trade-offs may in part be because of variation in resource availability at some of the study sites in the Yukon tundra. Densities of the three focal species were estimated using a ring of hard plastic measuring 1.13 m in diameter (1 m x 1 m area) and about 12 cm high. The ring was haphazardly and firmly placed on the tundra surface in each site and all wolf spiders collected inside the ring were identified and counted. This protocol was adapted from Buddle (2000). Results? Well… the most common species Pardosa lapponica averaged about 0.4 spiders per square metre. Some simple calculations will tell you just how common wolf spiders are on the Tundra: 4000 wolf spiders per hectare. Don’t forget – wolf spiders are only part of the Arachno-fauna in the Arctic. With confidence, this estimate of 4000 spiders per hectare represents a minimum. There are a LOT of Arachnids living on the tundra! In sum, this paper by Joseph is about studying some good old-fashioned natural history of a fascinating group of animals. The methods are straightforward, but the findings are significant. It’s pretty difficult to progress in ecology without a deep understanding of a species’ biology and life-history. Life-history studies are the cornerstone of biology, and I’m thrilled that Joseph recognized that fact and did this research on Arctic wolf spiders. I once heard one of those so-crazy-it-probably-isn’t-true bar “facts” that you’re never more than 6 feet away from a spider no matter where you go on Earth. While I assume there’s still some hyperbole about the “anywhere” part, the fact that it holds up in the Arctic certainly lends credibility to the tale!